In the last couple of years before his death, Sandy Scott was involved with ACW Wrestling in Rocky Mount VA, helping out behind the scenes creatively and also acting as their "trouble shooter", a role in which he also served in Jim Crockett's Mid-Atlantic Championship Wrestling and Ted Turner's World Championship Wrestling decades earlier. "That was what he needed," Sandra Scott recently wrote to me, "being at ringside once again." Eclipso, Jim Nelson and all the stars of ACW, along with stars from the NICW and BWC, honored the memory of Sandy at their monthly show in Rocky Mount on 4/10/10. Sandy's wife Sandra, daughter Tracy, and grandson Coleton were in attendance and were recognized. Sandy's wrestling boots and other memorabilia were in the ring before the show, and the traditional ten bell salute was conducted with Sandy's family before the show. The night featured a great crowd, hot matches, and some Mid-Atlantic wrestling legends who dropped by to pay tribute as well including Jim Nelson, "The Boogie Man" Jimmy Valiant, Don and Rocky Kernodle, Ric McCord, and the voice of World Wide Wrestling Rich Landrum. All of these great guys, along with the Kernodle brothers, are veterans of Jim Crockett Promotions and Mid-Atlantic Wrestling and were special guests there to pay tribute to Sandy Scott. 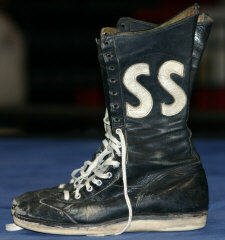 On display in the ring before the show were Sandy's wrestling boots, an old Crockett promotions photo album sold at the matches in the 1960s, a Starland Arena poster, his sportcoat worn in the early 80s when he was the "special NWA trouble-shooter" for Crockett Promotions on TV, and his watch. The watch was a tip of the hat to Sandy by those that worked for him many years ago when he was an agent for Crockett Promotions in towns like Greenville SC and Roanoke VA. Sandy was notorious with the boys for insisting that wrestlers be on time at his towns. Thom Brewer is the maestro behind the main tribute video shown at the event. The Scott Family is recognized before the show. • Rich Landrum presents a plaque to the Scott family from ACW Wrestling. Sandy was involved behind he scenes at ACW Wrestling in the last few years, having fun being around wrestling again. The bell sounds the Ten Count in honor of Sandy Scott before the show. It was a very emotional evening. Sandy's watch. You never wanted to be late at one of Sandy's towns. • Don Kernodle reads a poem he wrote for Sandy. Just a few of the ACW stars in action in Rocky Mount . . .
No so fast, spanko. Eclipso and Scott Weddle thought they had won the tag titles until referee Ric Petty restarted the match and the Wright Brothers rolled them up for the pin to keep the titles.